The following thoughts are my observations on the restaurant. Since I am not a professional food critique, I will breakdown my thoughts into manageable categories for the reader. The atmosphere of the restaurant was casual, but classy. It’s the kind of place you can feel comfortable bringing your parents or your date. I chose to wear a sports jacket, but some diners were wearing jeans. The waits staff were excellent. The waiter was well informed about every item on the menu, easily answering clearly every question asked. Not only was he able to explain about the food, but the farms and business that raised and produced the food served. Now we get to the focus, the substance of the meal, if you will: The Food. Dinner started with an appetizer of bread and butter. The bread was from Hewn bakery in Evanston IL, the butter was made by Pine River Dairy. In moving to a first course I had a lavender duck confit in a squash ragout that was amazing. Next, the house flatbread, with shredded carnitas pork, pickled garlic, basil, oregano, tomatillo sauce, and asiago cheese; all I can say is it’s even better than pizza (perhaps the highest praise I can offer). Before my entree, John sent over the grilled cheese: Hewn heritage bread, emmental cheese (an incredible swiss), and rubbed with white wine and garlic, and served with a house made dijon mustard. Finally, my entree: the Inovasi burger. Deep down, I am a burger and fries guy, and I was not disappointed. The meat was dry aged 28 days, the pickles were made in house, the cheese was a two year aged cheddar, served on a pretzel roll, with kennebec fries on the side. Everything was good, but the burger was a tier above, ranking as the best I’ve had. The food was amazing, the staff was attentive, and the ambiance was perfect. 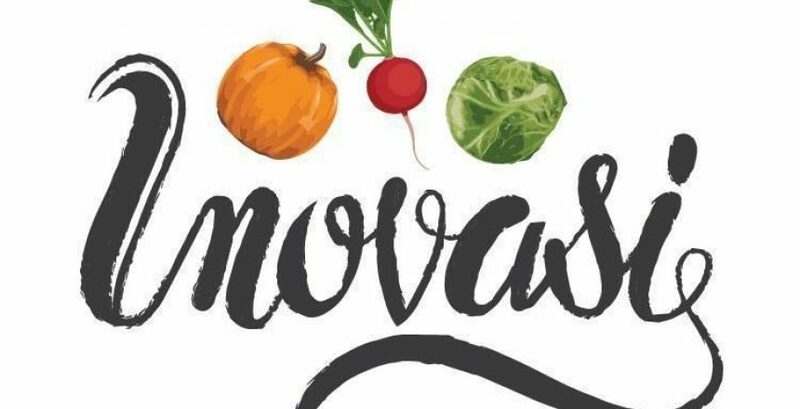 Inovasi takes local food seriously and follows through by delivering a high quality dining experience. If you are anywhere near the North Shore in Illinois it’s a must visit. 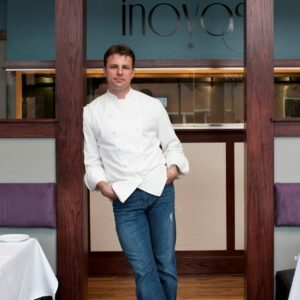 Before I left the restaurant I had the opportunity to talk with John and hear what Inovasi has coming up new. In late November they will be releasing their new menu for the Winter, which will feature some Native American dishes in addition to other seasonal changes.